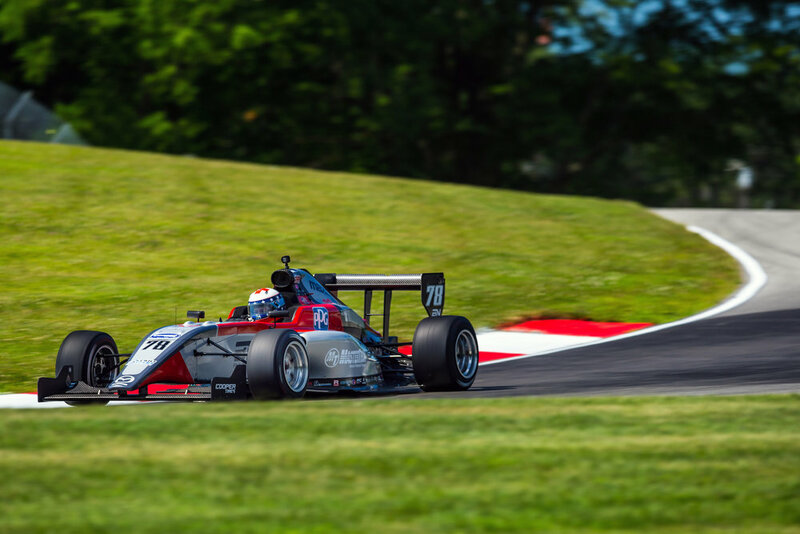 Lexington, Ohio, July 26, 2018 – Kris Wright comes to the Mid-Ohio Sports Car Course prepared to battle to the finish in the doubleheader of the Pro Mazda Series presented by Cooper Tires this race weekend, July 26-29. Wright tested at the 2.258-mile, 13-turn road course in Lexington, Ohio last week and feels very positive about competing on his favorite track, which is just two-and-a-half hours from his Pittsburgh, Penn. home. Wright’s most recent two races were across the border in Canada. He competed in the IMSA Prototype Challenge series Presented by Mazda race at the Canadian Tire Motorsport Park on July 8th. He shared his Extreme Speed Motorsports Ligier JS P3 No. 30 Le Mans Prototype 3 (LMP3) with Frenchman Yann Clairay to a second-place finish. He then went on to compete the following weekend in the Pro Mazda series on the streets of Toronto, where he collected a top five and a seventh-place finish in the doubleheader. The schedule for this weekend includes practice Friday morning, July 27, at 10:20-10:45 a.m., followed by qualifying for Race 1 starting line-up at 2:00-2:20 p.m. Saturday, July 28 will feature qualifying for Race 2 lineup 11:00-11:20 a.m. and Race 1 at 4:10 p.m. for 40-minutes. The final Race 2 will be on Sunday morning from 11:05-11:55 a.m. All times are Eastern. Sponsors for this weekend’s race are iHeartRadio, MasterTech, PPG and Wright Automotive. More information is available on Wright's Web site at KrisWrightMotorsports.com. Fans can also follow him on Facebook and Instagram. You can watch the race on ProMazda.com, RoadtoIndy.com or the Road to Indy TV App.